India’s largest power company, NTPC was set up in 1975 to accelerate power development in India. NTPC is emerging as a diversified power major with presence in the entire value chain of the power generation business. Apart from power generation, which is the mainstay of the company, NTPC has already ventured into consultancy, power trading, ash utilisation and coal mining. NTPC ranked 384th in the ‘2013, Forbes Global 2000’ ranking of the World’s biggest companies. NTPC became a Maharatna company in May, 2010, one of the only four companies to be awarded this status. The total installed capacity of the company is 43,128 MW (including JVs) with 17 coal based and 7 gas based stations, located across the country. In addition under JVs, 7 stations are coal based & another station uses naptha/LNG as fuel and 7 renewable energy projects. The company has set a target to have an installed power generating capacity of 1,28,000 MW by the year 2032. The capacity will have a diversified fuel mix comprising 56% coal, 16% Gas, 11% Nuclear and 17% Renewable Energy Sources(RES) including hydro. 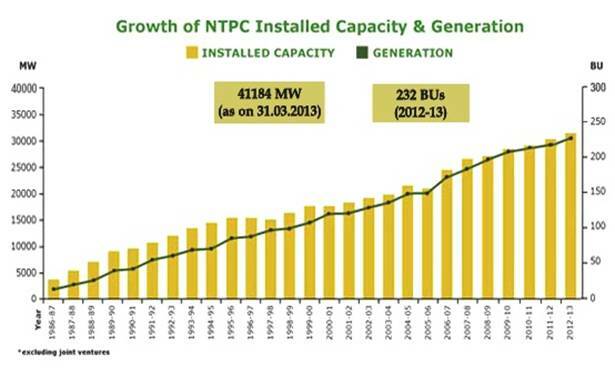 By 2032, non fossil fuel based generation capacity shall make up nearly 28% of NTPC’s portfolio. NTPC has been operating its plants at high efficiency levels. Although the company has 16% of the total national capacity, it contributes 25.6% of total power generation due to its focus on high efficiency. In October 2004, NTPC launched its Initial Public Offering (IPO) consisting of 5.25% as fresh issue and 5.25% as offer for sale by Government of India. NTPC thus became a listed company in November 2004 with the Government holding 89.5% of the equity share capital. In February 2010, the Shareholding of Government of India was reduced from 89.5% to 84.5% through Further Public Offer. Government of India has further divested 9.5% shares through OFS route in February 2013. 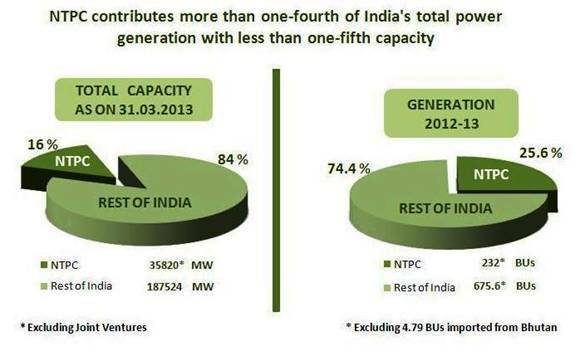 With this, GOI's holding in NTPC has reduced from 84.5% to 75%. The rest is held by Institutional Investors and the Public. The concept of Corporate Social Responsibility is deeply ingrained in NTPC's culture. Through its expansive CSR initiatives, NTPC strives to develop mutual trust with the communities that surround its power stations.